Another huge loss to malayalam film industry..For the malayalam film industry if It is " Big M's" who heads the acting department, then we can say it is Mr.Gireesh Puthencherry who is heading the lyrics dept.He worked with Sathyan sir for lot of films like "Innathe Chinthavishayam", "Manassinakkare" and Achuvinte Amma. "Enthu paranjalum" from Achuvinte Amma is one of the super hit song from Gireesh Puthencherry.Sathyan sir once revealed the chemistry between him and Gireesh Puthencherry.For the tune of "enthu paranjalum" Gireesh wrote another lyrics.When Gireesh noticed that Sathyan sir was not satisified with it , he asked more about the placement of the song in this film. Sathyan sir asked to make it as simple, suddenly within no time he wrote this beautiful song "enthu paranjalum".. Songs in Manassinakkare are also super hits. 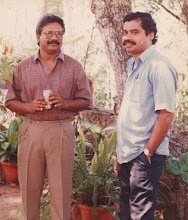 "Melle onnu paadi","Marakkudayal" were big hits. Big loss to all those who love good malayalam songs.